Russian President Vladimir Putin failed to clinch a concrete energy deal on a rare trip to Azerbaijan yesterday (13 August), dashing Moscow's hopes to challenge the dominance of Western energy majors in the former Soviet republic. Putin's trips abroad usually yield a flurry of deals and one of his closest allies, state oil champion Rosneft's head Igor Sechin, went to Baku last month to prepare the ground. Russia has long tried to increase its presence in Azerbaijan, a country Europe is hoping will help it lessen its dependence on Russian gas after Moscow's "gas wars" with Ukraine disrupted deliveries in 2006 and 2009. But on Tuesday, Sechin signed only a vague cooperation agreement with Azeri state energy firm Socar as Putin landed in Baku for the first time in seven years. "Under this agreement, we plan to cooperate on a number of issues including crude swap operations, a joint use of infrastructure," Sechin told reporters without giving details. Sources on both sides said a lot of differences needed to be removed for the companies to agree on teaming up on field development or swapping energy supplies. "Azerbaijan is asking such a high price for its assets that Rosneft is not willing to offer," a Russian energy source said, asking not to be named. A Socar source also said a lot of work needed to be done to iron out the differences. Western oil majors such as BP, Statoil and Exxon Mobil have dominated the Azeri oil industry since the collapse of the Soviet Union while relations between Moscow and Baku have been mostly cool. President Ilham Aliyev, who has governed the mainly Muslim country since succeeding his father in 2003, has mostly performed a delicate balancing act between the West and Russia. But ties were strained late last year after protracted talks between the two countries failed to reach a deal over Moscow's use of a radar station on Azeri territory. The only Russian company with a significant presence in Azerbaijan is privately-held Lukoil. Russian state gas monopoly Gazprom agreed in the last decade to buy almost the entire gas output from Azerbaijan, in what was seen as a successful attempt by Russia to defend its leading position in Europe's gas markets. But the deal never materialised in full, and Azerbaijan and oil majors have instead agreed to supply most of their gas through a new pipeline to Europe from 2019. The project does not represent a major challenge to Russia's gas dominance in Europe, although Moscow has always been keen to make sure Azerbaijan does not become a major transit route for gas from other Caspian Sea producers. The threat has somewhat diminished since major producer Turkmenistan rerouted most of its gas to China away from Russia and the European markets. Azerbaijan has almost a trillion cubic metres (tcm) in gas reserves, according to BP data, relatively small compared to Russia's 33 tcm. Last month, industry sources told Reuters Rosneft was seeking a stake in Azerbaijan's Absheron gas project but this was not mentioned in the cooperation agreement. SOCAR and French oil company Total each hold 40% in Absheron with the remainder being held by GDF Suez . Azeri officials have said Absheron will help increase Azeri gas exports in coming years. Sources have also said Rosneft and Socar were also considering swapping Azeri oil in Europe against Russian supplies to Asia which would allow Rosneft to service its plants in Italy and Germany while Socar would supply its Asian buyers. Azeri gas from the offshore Shah Deniz II field in the Caspian offers Europe a means of reducing its dependence on Russia which currently provides around a quarter of the continent's 500-billion cubic-metre-per-year (bcm/y) annual gas consumption. Two pipeline projects were competing to obtain the 10 bcm/y from Shah Deniz, available for the EU market: Nabucco West and the Trans-Adriatic Pipeline (TAP). The Shah Deniz consortium, led by BP, Norway's Statoil, Azeri firm SOCAR and France's Total. The Shah Deniz consortium chose TAP over Nabucco West stating as a reason the higher gas prices in Italy and Greece. 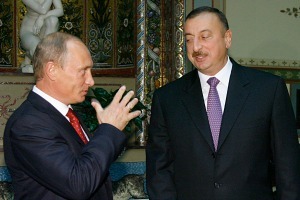 However, press reports suggest that Azerbaijan doesn’t want trouble with its Russian neighbour. It is widely known that Russia has an aversion for the Nabucco project and has designed its own pipeline project, South Stream, as a means to kill the EU-favoured project. Any story in the Western press that includes the word ‘Putin’ always seems to carry a message of failure. Are they distributed daily by the NSA? Or do they just provide some facts and general guidance?